The TAS-1056.ACPR 50 kN Capacity Automatic Marshall Stability Test Machine with Utouch Pro Control Unit is designed to determine the maximum load and flow values of bituminous mixtures. 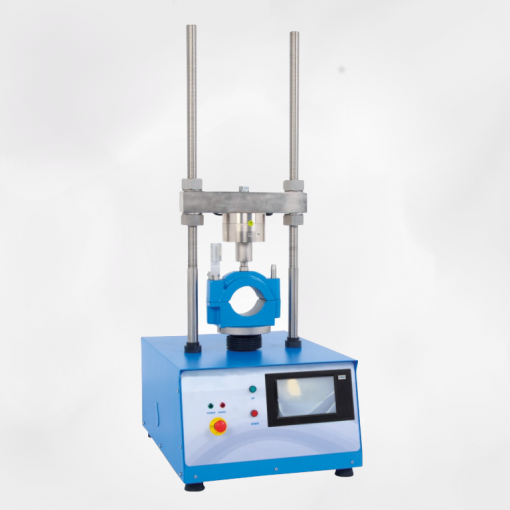 With suitable accessories TAS-1056.ACPR can perform crack propagation by semi-circular bending test and determination of the indirect tensile strength of bituminous specimens. 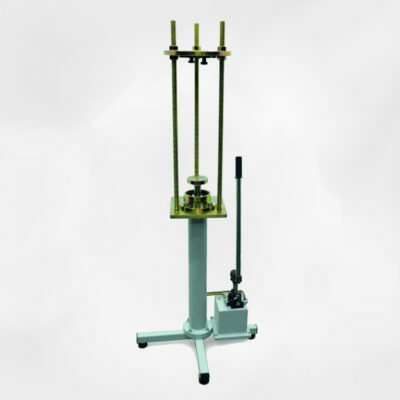 The machine comprises of a robust, compact two column bench type compression frame with adjustable upper cross beam. 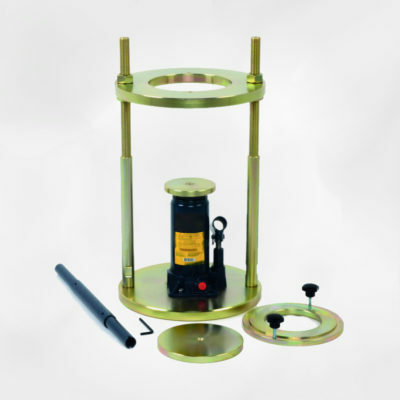 Motor, worm gear system and U-Touch Pro Control Unit are housed within the base unit. The speed of the lower platen can be adjusted between by using U-Touch Pro Control Unit. For safety, up and down travel of the lower platen is limited by limit switches mounted on the gear system. Rapid adjustment of the platen can be done by using the up and down buttons located on the front panel. 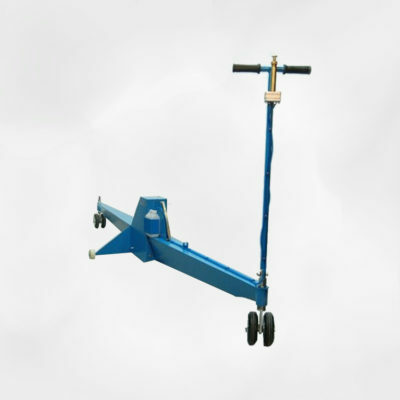 The machine can be hand operated by a lateral hand wheel for calibration purposes. The measuring system consists of a 50 kN capacity strain gauge load cell fitted to the upper cross beam and a 25 x 0.001 mm linear potentiometric displacement transducer fitted to the Breaking Head. U-Touch PRO Control and Data Acquisition Unit is designed to control and process data from the loadcell and displacement transducers fitted on Marshall Stability test machine. TAS-1056.ACPR can perform marshall, indirect tensile and semi-circular bending tests according to EN,ASTM/AASHTO and BS standards listed above. The Unit can perform tests stand-alone fully, automatic without the need of a PC or USOFT-1056 software. Software can be used to get additional advanges described in the section below. U-Touch PRO incorporates a user-friendly interface that shows all existing menu options as buttons and tabs. Users can activate or deactivate certain functions easily and input test data by using touch keyboard. Parameters such as test information, user information, sample information and test parameters can be modified and saved for later use by operators. Control Unit offers many additional unique features. Utouch Pro enables the users to display current memory usage and test results with its advanced data and memory management interface. U-Touch PRO can export, copy, or delete the test data saved in its internal memory. Results and additional information for previous tests can be recalled using U-Touch PRO. Test reports can be instantly printed using an (optional) thermal printer. U-Touch Pro TFT can simultaneously display machine status, test values, warnings during operation and test graphs in real time. USOFT-1056 Marshall Stability Test Software is developed for Marshall stability tests, indirect tensile tests and semi-circular bending tests in accordance with EN 12697-34, EN 12697-23, EN 12697-12, ASTM D 1559, D5581, D 6927, D6931, AASHTO T 245 and TS EN 12697-44. The software includes control of machine, acquisition of load and displacement data, saving them and generating reports. The software accepts specimen diameter and height as an input parameter. It automatically calculates correction factor coming from the standards with respect to specimen thickness. The stability value is calculated regarding this factor. The software continously updates load and displacement until the end of test. When the test is completed, the sharpest slope of the graph is calculated. The sharpest slope is shifted 1.5 mm to the right side of the graph and the intersection between 2nd slope and original test data is recorded as the stability value for the test. The horizontal distance between the intersection of first slope and X axis and intersection of test data with 2nd slope is recorded as “flow” value. The point that this line crosses displacement axis is commented as an offset. This offset is subtracted from the displacement value at peak point and called as flow. The report includes all results for 9 samples. The user can see 9 of the results on the same screen for easy comparision. The software supports SI, Imperial and kgf unit system. TAS-1088 Marshall Penetration Piston for Stability Test.